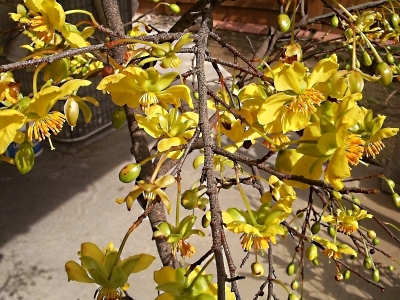 Ochna Integerrima is a popular Lunar New Year flower, especially in Vietnam. The tree is prominently displayed (in a container) inside homes during the 3-day holiday, adorned with ornaments and red envelopes. 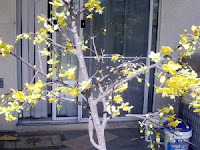 There are two types of ochna integerrima -- one with nine petals (rare and hard to cultivate) and the other with five petals (common). The one in our garden is the 5-petal flower. After the flowers fade, they are replaced by small and inedible red fruits that take a flowery shape. In effect, the tree produces two seasons of flowers. This is not the case with the 9-petal tree.